Where to start? Where to start? When I last left you I was complaining. Not much fun there. And I was complaining about food in England. A rather predictable topic, I'd say. So, no complaining this time. There will, however, be a slight amount of unpleasant reporting. Don't worry, it's not as bad as it could be. Things that are awesome: I went to London last friday to do a bit of walkabout before our Secret Cinema excursion. Both the walkabout and the event were fantastic. It might not be the most efficient way to go about things, or provide the most complete view of things, but I'm rather enjoying simply walk walk walking around as a method of being a tourist. I had an agenda, but that didn't work out due to my unwillingness to wait in line for an hour. Whatev. The experience of the Secret Cinema was fantastic as well. 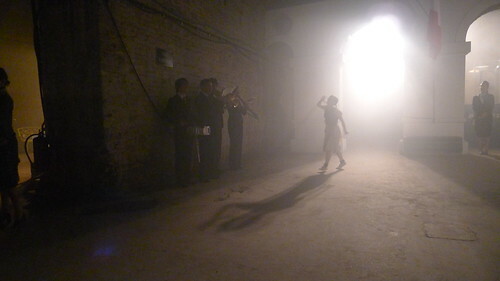 It was held in the Old Vic Tunnels by Waterloo, in the theater built for the premier of the Bansky film "Enter through the Gift Shop." Imagine Algiers in the tunnels of London. Also awesome: going to a Reading FC match. The crowd was quite polite, but the visiting side (Derby County) had hilarious fans who chanted and sang to their hearts' content. The home side won the day, so everyone left happy. Okay, maybe not the Derby fans, but whatev. On to the unpleasant reporting. I'm currently locked in an epic battle of wills against my head. The migraine has not struck, but yesterday and (now) this morning, things are on the cusp. Normally I'd schedule an acupuncture appointment, but I'm not around my lovely Luke and Melinda and I've received no recommendations. So wish me luck! ** Lunch time update: things are looking up, people! Head appears to be cooperating and the loud lady with the particularly grating voice who sits directly behind me is almost quiet today. Almost.